Last week, Delta Airlines took delivery of a new Boeing 777-200LR, the first of its type delivered to a U.S.-based carrier. The aircraft will be known as "The Delta Spirit." 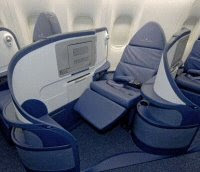 The airline plans to have similar sleeper suites installed on all of the B-777 aircraft in its fleet by 2010. Economy passengers flying on the new B777-200LR aircraft will enjoy comfortable new all leather slim-line seats, manufactured by Weber Aircraft LP. The Weber seats have ergonomically designed cushions, and provide additional under-seat storage. Each seat has on-demand music, movies, games and television on individual 9-inch video monitors. The aircraft is set to begin scheduled service tomorrow (March 8, 2008) with a flight between Atlanta and Los Angeles. The first international run for Delta's new B777-200LR, will be on March 9 when it flies from Atlanta to Tokyo.